Asha will soon be singing in Dev Anand’s forthcoming film – “Chargesheet’ which is under production. Almost after 28 years she is lending her voice for his film. PTI states – “The recording of the songs will be held later this week,” Dev Anand “She last sang for my film Lootmaar which was released in 1980,” he said. The scintillating number Jab chahe mera jadooo…” is still popular among music buffs. The veteran actor-filmmaker who has been busy in the film-making also said that Asha would be singing atleast a couple of songs. Would these songs hit the chart buster like it did in the yesteryears? This entry was posted on Monday, September 22nd, 2008 at 11:48 pm	and is filed under Flash news. You can follow any responses to this entry through the RSS 2.0 feed. You can leave a response, or trackback from your own site. 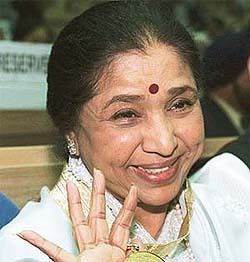 asha bhonsle, what a nice singer you are! actually nobody has words to comment on you. I am very much fond of her songs since my childhood and also my family.